I absolutely love seeing how many new non-dairy yogurts are coming available these days!! More and more plant-based options are constantly showing up on the grocery store shelves, and I definitely want to support these products with my dollar! However, it can quickly add up for a few ounces! So I keep my favorites like Forager, So Delicious, and Yoconut for special outings. 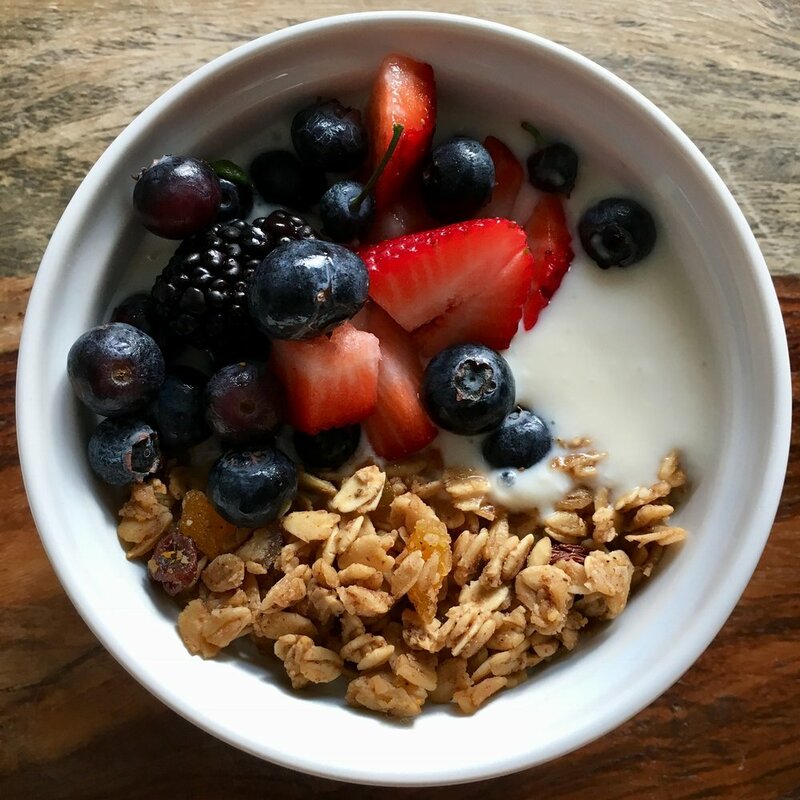 So, when I got my Instant Pot last year, I knew yogurt would be one of the first things I needed to master in it! After doing my internet research, I realized almond milk yogurt would be too involved for me to make regularly because it requires thickeners and such. I wanted something more or less I could do mindlessly. And I found it! A lot of people said that milks with added sweeteners and thickeners just wouldn't work for this, but after hearing someone have a positive experience with the Costco brand, I decided to give it a try! And while Kirkland Signature milk does have sweeteners and thickeners in it, somehow it still turns out great! First, pour most of your Kirkland Brand 32oz soy milk into a large enough liquid measuring cup (this makes it easier to pour without spilling later). Then take your probiotic's serving size (mine was 2 capsules) and empty it/them into the milk. You can just gently twist apart the capsule ends, and dump in the powder. DO NOT add the capsule itself to the milk! Whisk very well, and add the rest of the milk, if any left in container. I hope you find this as easy to keep on repeat as I have, and if you like it, leave a comment below! Pour milk into your clean glass jars. Any size is fine, but the closer in size, the more evenly the yogurt will cook. Place jars into the Instant Pot cooking pot, but do not screw on their lids. Leave them open to air. When the time is up, your Instant Pot should look like this and say "Yogt." Take your jars out, pour off excess liquid, put lids on, and refrigerate to chill! and is great for parfaits, adding to recipes-like naan, tzatziki sauces, dressings, and makes a delicious addition to smoothies! 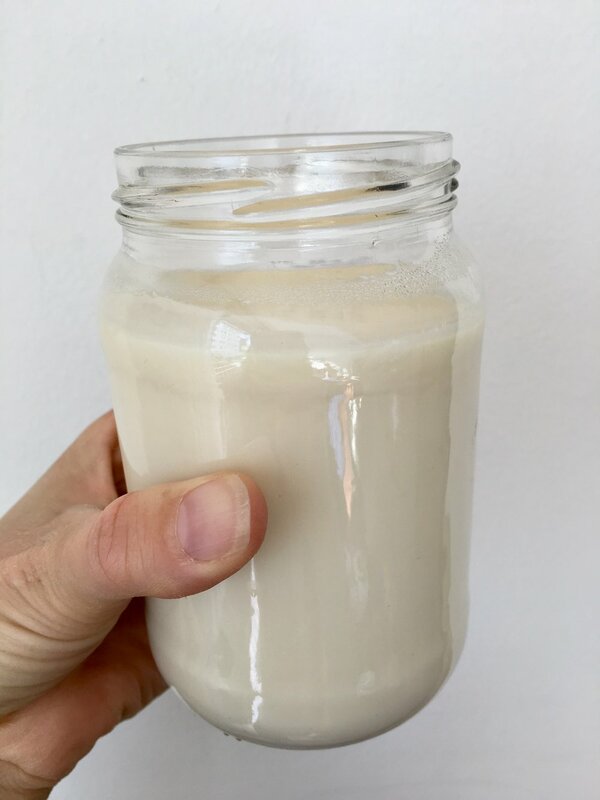 This non-dairy yogurt is so easy to make, delicious, and so much cheaper than store bought options! You'll have it on repeat in no time. In a 4 cup liquid measuring cup, add about 75% of the milk (after it's well shaken). Then open and empty the probiotic capsules into the milk and whisk very well until no clumps remain. Pour the rest of the milk and whisk once more. Then divide the milk into your clean glass jars and put in the bowl of the Instant Pot without the lids on. Lock lid in place, turn vent to Sealing, then hit the "Yogurt" setting, and increase time to 10:00. If your probiotics are old, it will take longer. You can check on the yogurt after 10 hours and then run it again if it hasn't set up. Depending on how close it is to set, you can add 2, 5 or 10 more hours! When you check again and it IS set, pour off the extra liquid on top, put the lids on your jars, and chill in the refrigerator for at least 4 hours. The result is creamy, tart and delicious! For a little treat, pour a tiny bit of maple syrup (a little goes a LONG way here, I promise!) and top with berries and granola. OR leave tart and stir in some Vegan Lemon Curd! Top with a little granola or crumble topping for an extra special treat! *You may be wondering if other soy milk brands will work, and as far as I have experimented, the rest are quite finicky! It depends a bit on the sweeteners and thickening agents in the milk, and I have only had consistently great results with Kirkland Signature brand from Costco. But if you decide to experiment, let me know how it turns out! This yogurt is great for parfaits, adding to recipes-like naan, tzatziki sauces, and even in smoothies! Choose one that is stable at room temperature. If the cultures will die outside of the refrigerator, think what happens when they come in contact with stomach acid!